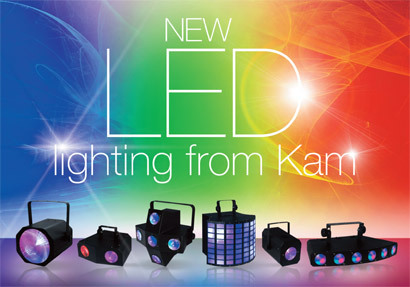 Kam have introduced a versatile new range of DJ effect lighting. There are six professional and affordable LED lights in the series, which is due to hit Kam retailers any time now, each offering a different multi-colour LED lighting effect. Compact, lightweight and user friendly, the Kam LED Minx is a classic disco moonflower effect that can fill a room with its stunning RGBW (red, green, blue and white) beams. Ideal for floor-to-ceiling and wall-to-wall coverage, the unit features Sound-to-Light operation controlled via a built-in microphone. Back by popular demand, the Kam LED Javelin V2 is a dual lens lighting effect. The unit is a multi-colour RGBW unit that is easy to operate and can be controlled via sound-to-light or built-in presets. The Kam LED Concept V2 is a moonflower 'matrix' style LED effect, guaranteed to fill dance-floors and rooms from a single fixture point. The unit projects multi-coloured RGBW LEDs. The Kam Concept V2 creates eye-catching, dynamic and colourful patterns and is ideal for mobile DJs, bars and clubs. The Kam LED Rodeo is a classic wide-angle derby-style DJ lighting effect. The unit uses RGBW beams to generate stunning effects from its five lenses. The LED Rodeo is a guaranteed dance-floor filler; add a little smoke to enhance the dramatic, eye-catching effects. The Kam LED Bronco is a six-lens gobo lighting effect which projects bright RGBW coloured patterns and beams to create beautiful atmospheres, perfect for enhancing any lightshow. The unit supports full DMX control as well as master/slave operation. The Kam LED Fiesta is a five lens multi-colour DJ effect that uses RGBWA (red, green, blue, white and amber) LEDs to create fast paced dancing light beams. The breath-taking effects need to be seen to be believed and the unit offers flexible control options including DMX and master/slave operation.